As a follow-up to the Mama Mondays post on Why Families Should Play Games on family game night, I wanted to provide some practical information on what games for families to use for family game night, neighborhood game night, church ministries, or special events. I’ve divided the list into a few different categories such as age or group size in order to give it a little more organization. *This post makes use of affiliate links. For a full disclosure, please visit the About page. Memory is one of our favorite games for families for this age group and utilizes memory skills, matching, and critical thinking. We started at the age of 2 (possibly even younger) with our firstborn, but not with the entire game. For very young children, I would start by choosing out just a few matches to start with and let them get the hang of it before building up to more. Hi Ho Cherry-O is another favorite and can be played from an early age with modifications. This game teaches colors, counting, and following directions. In fact, before you even try to play the actual game, you could have your child do some color sorting by putting all of the cherries on the correct trees! I love this game because you can make your own and use it to teach just about anything: for example,Go Fish Colors, Go Fish Shapes,Go Fish Animals , Go Fish Alphabet, and so on. To make your own, just buy a pack of index cards, print off some graphics (or use colored cardstock) and tape or glue them to the index cards – laminate them for longer use. Our middle child has always been our most active child and has been that way from birth, literally! Go Fish is the one game he would actually sit still for at a fairly young age – young enough that he couldn’t even say, “Go Fish!” correctly. For little hands, you might try these card holders , too. We played this game with our two oldest boys before our youngest (at the time) son could even count. We just counted the spaces out for him. Why did our active boy enjoy this game so much? He looooved pressing the domed popper in the middle. He also really enjoyed landing on other players and sending them back home. 🙂 After moving, we lost some of our pieces, so I’ve been eyeing this Despicable Me Edition . The best thing about this classic, aside from being candy-themed, is that you move by colors rather than numbers. Thus, you can easily play with very young children. We absolutely love this i-spy type game that was introduced to us by friends! It is easy enough to play that very young children can participate, but also quick-paced and competitive enough that even my husband enjoys playing. It’s just perfect for our broad age range! The board is a series of large square tiles that are moved often throughout this picture-finding game. With very young children, you can make every card an all-play card and take a less competitive, more team-work approach. Battleship is an oldie, but a goodie. I love this game because it’s challenging enough that my husband and I can play each other for at-home date nights, yet our two oldest sons can also play each other. Our middle son learned to play it at the age of 6, but probably could have learned earlier. This game of strategy only requires 2 players! 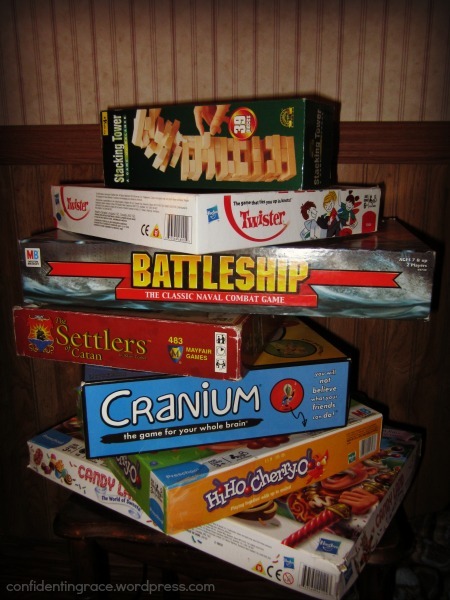 We found this awesome spin-off of Cranium (see under Large Group Games) at Goodwill and it has quickly become one of our favorite games for families! Easy enough for the little ones to participate, but interesting enough for the teen in the house, too. These are 2-4 player games that even young children can play as they do not involve counting or reading. Don’t Break the Ice uses a small plastic hammer to knock out individual ice cubes until the whole platform falls. Don’t Spill the Beans is a game of balance in which plastic beans are added to a pot one by one until the pot tips one way or the other. 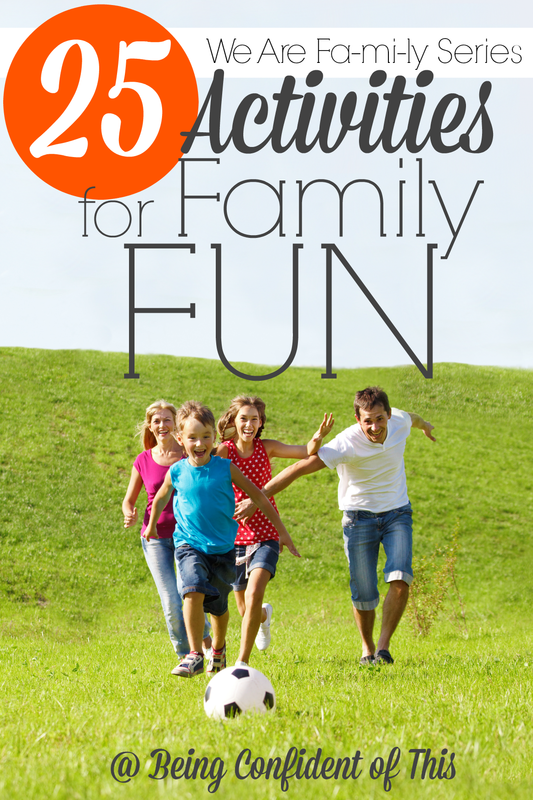 These games for families both utilize and teach scientific principles, too! Risk is a game of strategy and conquest. You can make and break treaties, create and destroy armies, and take over the whole world! I think this game appeals more to boys rather than girls, but my sister and I both happen to really enjoy it even as adults. Risk is one of the more time-consuming games for families, but soooo worth it! 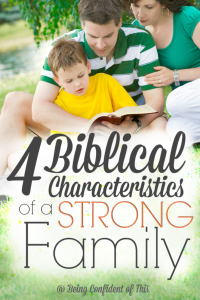 – see description in Family category below. Murder – this game has been a youth group favorite wherever we go, and we even played it at an adults’ game night once! You’ll need lots of playing space for the game to work well and you also need darkness. We created our own dim area by covering some windows when we played. Basically, one person is chosen by random to be “it” and is unknown to the other players. Then, everyone spreads out and the “murderer” is free to work. What makes this game fun is that when a “body” is found, the lights come on and all players gather together to make accusations and try to figure out who the murderer is. If the person accused is not truly “it,” then the game continues! Be sure to look up extended rules online. Jenga is easy enough for small hands, but interesting enough for older brains, as well. 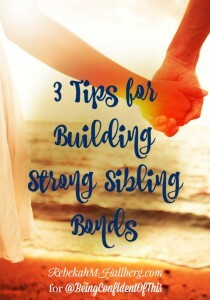 We have played this game with our four-year-old twins and it works very well as long as we help them a bit. – see description in Elementary category. Settlers of Catan is our all-time favorite family game (we actually call it “The Game”) and can be played with as little as 2 players and with as many as 12 if you want to re-paint or decorate some of the pieces like we did. The game is very unique and involves a lot of strategy and planning, as well as bartering. Basically, you are a “settler” who chooses where to build. Your object is to grow your territory using resources that you earn according to rolls of the dice. You will build roads, cities, and other settlements as you earn the resources to build with. You can also trade with other players, but beware of the black robber! Although this game is a little more expensive and takes time to learn, it is well worth the effort and expense!! This is one of the least expensive games for families ever, but is so much fun. All you need is a set of dice (6, I believe), a printed out set of rules from the Internet, and paper and pencil to keep score with. Although this game is numbers oriented, our middle son learned to play with help at age 6 and really enjoyed it. I love this game, especially for large group play, because it combines aspects of many of my favorite games. There are 4 categories: one uses word-based clues (missing letters, scrambled letters, spelling, etc. ), one uses music/acting based clues similar to charades, one uses data-based clues (true/false, multiple choice, etc. ), and one uses clues that require drawing (sometimes with your eyes closed!) or sculpting with clay. It’s basically like playing pictionary, charades, trivial pursuit, Boggle, and other games for families all at the same time! The best part, however, is that you play in teams, so this game can work for anywhere from 4 to 20 or more players. Here’s another party favorite among our games for families. It is easy to learn and usually involves a good deal of humor. Apples to Apples also gives you insight into the people you’re playing with. You can also buy a kid-friendly version called Apples to Apples Junior . This game is a favorite for me and probably anyone who is good with words and/or talking. It can be used in a group as small as 4, but is more fun with larger groups. The beeping timer makes the fast-paced game-play even more intense and competitive! 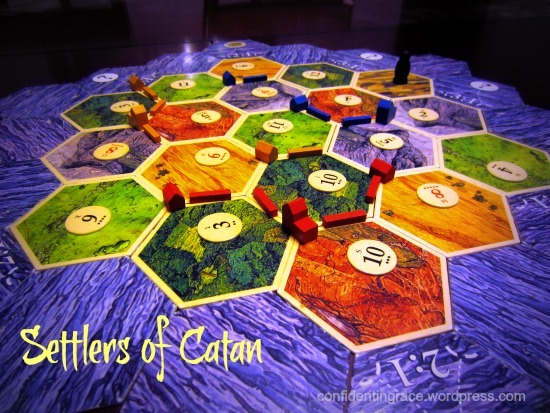 Settlers of Catan – see the description in family games. Euchre – an inexpensive card game that requires only a single deck of cards. You can play with Four or more. I had never heard of this game until I met my husband, but it quickly became apparent that I would have to learn. It took me a while to learn this game, but it has quickly become one of my favorite card games! Hand and Foot – another inexpensive card game in which you have two “hands” of cards – one to start with and a second one, called the “foot,” that you play when you finish your first hand. I like this game best when played with partners, in which case you would need at least four players. If you have enough card decks and table space, you could play with a group of 8-10 easily. This game simply requires several decks of normal playing cards. Look up the rules online for more information! Mafia – this game isn’t your typical board or card game, but can be fun if you have an adventurous group of people. Basically, it’s a whodunnit? game, narrated by a player who sits out of the gameplay and simply tells the story. The game involves a “criminal” who points at a victim, a doctor, who points at someone to save, and a police officer or detective who chooses someone to accuse. The most important part of this game is choosing a good narrator because a lot of fun is in the details that they make up. Look up the details online! Wink Murder – okay, so this game may be a bit juvenile for adults, but I guess I’m a kid at heart. 🙂 This is another game that you can play on the fly with no preparation and no supplies. Look up the rules online for more information. Children and teens alike enjoy this game of contorting one’s body in order to touch the correct colored circles. With our two youngest, we don’t bother with differentiating between right and left since they haven’t learned this yet. Instead, we just say, “Put your hand on blue.” Surprisingly, one of the favorite parts of this game is the spinner! Hide-n-Seek – yes, this is usually an outdoors game, but a few winters ago when I was doing some in-home childcare for a friend, I decided we could play indoors! In fact, it becomes even more fun when you turn off all but a few lights and play Scary Hide-n-Seek! Just be sure to tell the players if there are any off-limit areas before you start. Sardines – similar to hide-n-seek, only the player who is “it” hides and everyone else tries to find him or her. 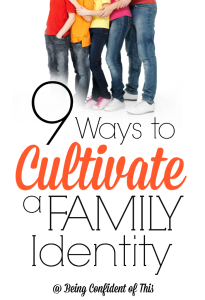 The twist is that when you find “it” you have to hide along with them until everyone ends up in the same hiding spot. Simon Says – I know this is an old school game, but my children love it. The most popular position is Simon, of course, but it’s really good for our younger children to learn to follow directions and to listen! Mother May I? – another old school game, but gets my children up and active without being too crazy. Additionally, Energy-burning Indoor Fun for Kids is chock full of ways to help the kids burn off extra energy when you’re stuck inside. 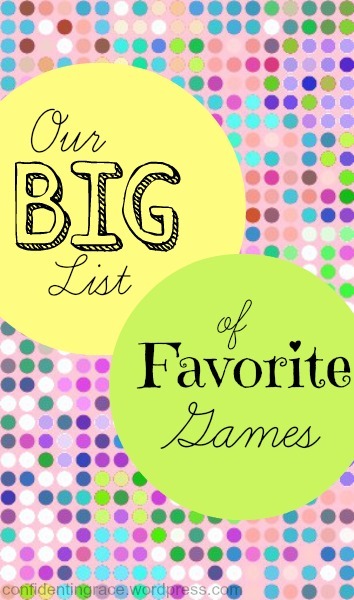 Well, that’s it for our BIG list of favorite games for families. I hope you find some ideas for new games to try out at your next family game night. 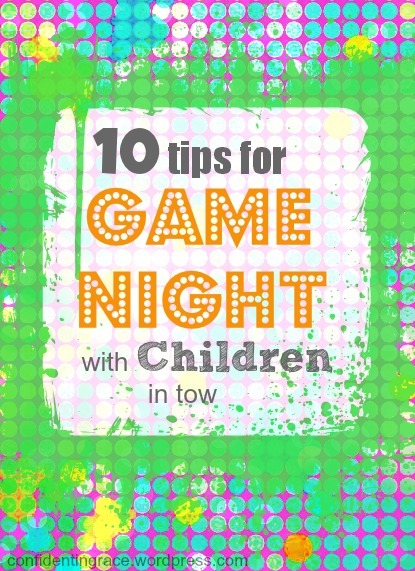 To help you get started, here are tips on how to host a game night with young children in the home. 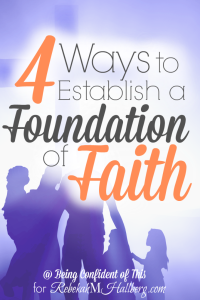 I also have a pinterest board specifically for learning games and activities where I gather ideas for homeschool or just home learning fun, and an AWANA/VBS board where I gather ideas for youth group and children’s ministry. For family-specific activities, be sure to visit the Family Fun Day/Night board, too. We’re always looking for new family oriented games to add to our collection, so please let us know if you have a great suggestion! 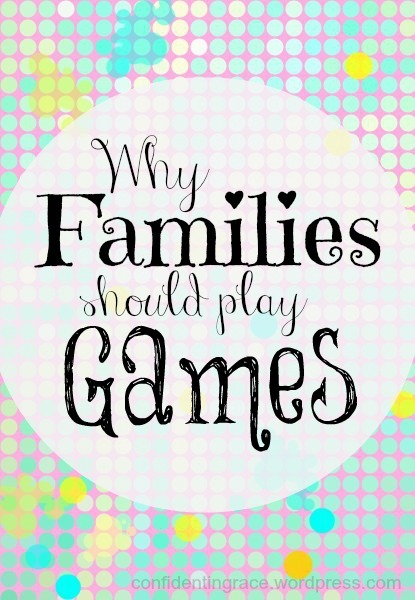 What is your family’s favorite game? What games would you add to the list?